The view, space in the villa and the fact there are 3 bedrooms. Serenity of the place. Hospitality,Politeness, spotless cleaning, location and views. If I could rate at 11 I would. Everything was perfect. fantastic host, great house with a spectacular view and located in the right position to enjoy nice beaches and ten minutes drive to argostoli. Superb! The villa was beautiful with amazing views of the sea and mountains, the pool area and gardens were exceptional. What topped it for us was our host Europes, nothing was to much trouble and she was on hand to help at any time. we had a wonderful relaxing holiday and will definitely be returning. Europe was.very welcoming and was eager to please. The views are spectacular. Lock in a great price for Europes Villas – rated 9.3 by recent guests! One of our top picks in Lakíthra – and a guest favorite. Boasting free Wi-Fi and located in Fokata Village, Europes Villas are surrounded by well-tended gardens with a furnished terrace or veranda overlooking Argostoli Bay and St.George’s Castle. Tastefully decorated, this accommodations consists of an open-plan living, dining and fully equipped kitchen area for the preparation of meals. It includes air conditioning, an LCD 32” TV and CD/DVD player. Europes Villas is within 2,300 feet from traditional taverns, a bakery and minimarket. The popular town of Argostoli is 3.7 mi away, while Kefalonia Airport is at a distance of 1.9 mi. A 10-minute drive will lead you to the beaches of Makri and Plati Yialos, Ai Xelis and Ammes. This property also has one of the top-rated locations in Lakíthra! Guests are happier about it compared to other properties in the area. This property is also rated for the best value in Lakíthra! Guests are getting more for their money when compared to other properties in this city. When would you like to stay at Europes Villas? 32” TV and CD/DVD player. This special offer includes a free car rental. 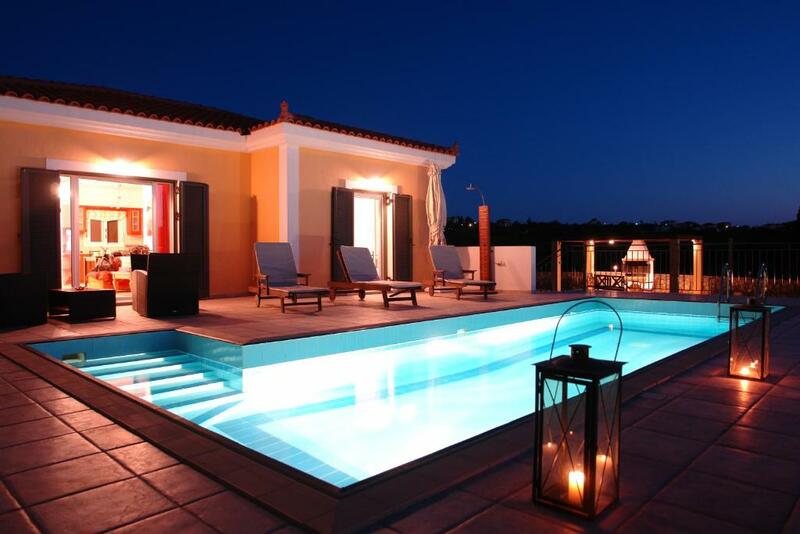 - Spacious, furnished veranda with views of the garden and Argostoli Bay. A small children's pool is available. Η δημιουργία του συγκροτήματος Europe’ s villas είναι προϊόν της αγάπης μας για την Κεφαλονιά και της επιθυμίας μας να μοιραστούμε την ομορφιά της ελληνικής φιλοξενίας με τους πελάτες μας. Στόχος από την αρχή της λειτουργίας μας είναι η παροχή υπηρεσιών υψηλών προδιαγραφών . Πρόκειται για μια οικογενειακή επιχείρηση στην οποία συμμετέχουμε όλοι προσπαθώντας να επιτύχουμε ένα άριστο αποτέλεσμα. Υποδεχόμαστε τους πελάτες μας όχι μόνο με ένα ζεστό χαμόγελο αλλά και με νόστιμα σπιτικά παραδοσιακά εδέσματα. Επιθυμία μας είναι ο πελάτης να νιώσει οικεία, να ευχαριστηθεί την διαμονή του και να φύγει από εμάς με τις καλύτερες εντυπώσεις, έχοντας περάσει αξέχαστες στιγμές. Έχουμε καταφέρει στα χρόνια λειτουργίας μας όχι μόνο να επιτύχουμε τους στόχους μας αλλά και να δημιουργήσουμε με τους επισκέπτες μας ζεστές φιλικές σχέσεις. Αγαπώ πολύ τον τόπο μου και γι' αυτό αποφάσισα να δημιουργήσω αυτή την επιχείρηση. Ασχολούμαι τα τελευταία 9 χρόνια με την λειτουργία του συγκροτήματος και προσφέρω απλόχερα την φιλοξενία μου πάντα με χαμόγελο, σεβασμό και καλή διάθεση. Βρισκόμαστε σε ένα πανέμορφο τοπίο γεμάτο δέντρα και λουλούδια. Πρόκειται για ένα ήσυχο και ασφαλές σημείο γέματο πράσινο στο οποίο μπορείς να ηρεμήσεις και να θαυμάσεις την εκπληκτική θέα που διαθέτει στον Κόλπο του Αργοστολίου και τα γύρω χωριά. Είμαστε σε κοντινή απόσταση από την πρωτεύουσα του νησιού, το Αργοστόλι όπου υπάρχουν πολλές επιλογές για φαγητό και για διασκέδαση. House Rules Europes Villas takes special requests – add in the next step! For stays of minimum 6 days, a prepayment deposit via bank transfer is required to secure your reservation. The property will contact you after you book to provide any bank transfer instructions. The beds - can be a bit more comfy. It was peaceful with a view to die for! Europe is a perfect host, collecting us from the airport and baking us cakes and biscuits. Recommending the best beaches. Fantastic holiday and an island we will return to. It was spacious and well laid out. I didn’t like leaving... that’s it. We loved everything! Not much at all. It was a little bit remote but the location is not so important as Europe was always happy to arrange travel if we didn’t want to drive. You need a car to go anywhere as very remote. Poor lighting into the village at night. We loved every thing. The view from the house was amazing. The swimming pool was lovely. The house had everything you need.it was a lovely vacation. Thank you very muche yorupas . We had a fantastic time here, really made our trip to kefelonia. The villa and views were amazing! We will be back.